This is the third in a series of download DVDs dedicated to tricks and routines using ESP cards. 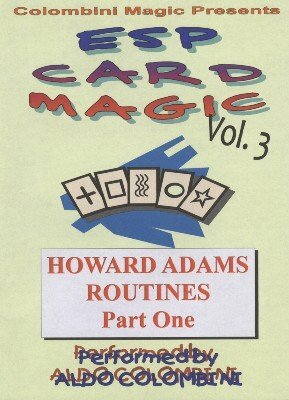 This volume 3 features routines by Howard Adams. Cidentaquin is one of my favorite ESP routines. In volume 4 you will find a variation which adds yet another climax. Also remember that you do not have to use ESP cards for these effects. You could use sets of identical business cards (even possible impromptu after a business meeting where most people have a stack of business cards with them). Or perhaps use post cards - sets of five cards from well known cities such as Paris, New York, Sidney, Moscow, Rio - and suddenly you have a completely different effect with new angles for interesting story lines. CIDENTAQUIN: One of the best routines with ESP cards. A spectator picks a card (free choice). You split the deck into two halves and deal cards face up at the same time from both packets. Only two pairs will match (say the four Circles). The spectator’s card is the remaining Circle. SYMBA WONDA: The deck is shuffled and cut. Five spectators pick five cards each apparently totally at random. The five cards are one of each symbol. This is amazing. PAKADUA: A spectator selects a card (free choice). He then shuffles the deck with the cards face up and face down. You deal seven cards face down taking them from both sides of the deck. One card is then picked and it matches the spectator’s selection. CELEBRITHREE: After the deck is shuffled a spectator cuts it half face up and half face down. He then removes cards from each packet totally at random creating at the same time three pairs. These pairs are matching (say two Circles, two Squares and two Stars). PREDICNIC: A prediction involving cards and coins. Great combination. You will never stop doing this clever effect. TULEFTA: Probably the most famous trick by Howard. Two sets of ESP cards are shuffled and paired by the spectators totally at random. Yet, the five pairs match (two Circles, Two Squares, etc.). TRIPLERSONS: In this effect a series of matching tests are conducted with three people. REVERSEE: Duplicates of two cards selected by two people are found reversed in the middle of the deck. CARD TO BELIEVE: You apparently find a person’s mentally selected card and place it in the deck between two of its duplicates. THINKARD: Two people mentally select two ESP symbols and you reveal them in different ways.